One thing I love about this time of year is sharing holiday memories with my family. We baked a lot during the holidays and still continue that tradition today. That love of baking during the holidays has transpired from baking for the whole family to also baking for just my husband and me. We try to do date night once every few weeks. With the busy holidays, we have to have a plan for a night at home every once in a while. Even if we aren’t going out I still want to make it a special evening for the both of us. I love to bring out our favorite holiday recipes to enjoy together as we snuggle on the couch and watch a movie together. 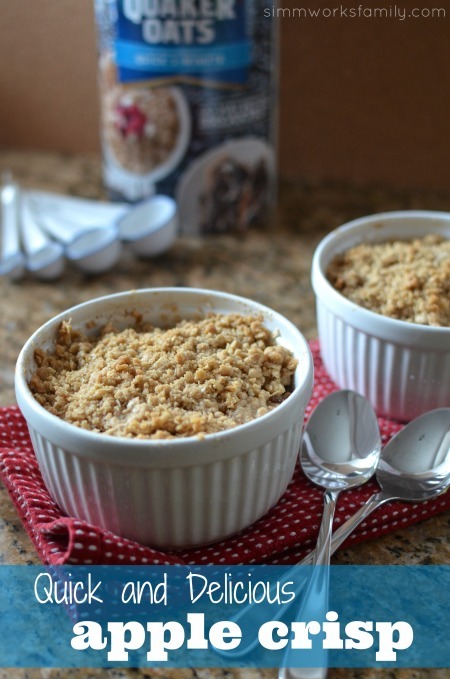 I always have apples and Quaker oatmeal on hand so individual apple crisp desserts were the perfect solution to our next date night in. Now I have to say that while I love date night in, I don’t want to labor in the kitchen all night. This dessert recipe is the perfect dish to make with a limited amount of time. it took me about 15-20 minutes to throw together and 25 minutes to bake. 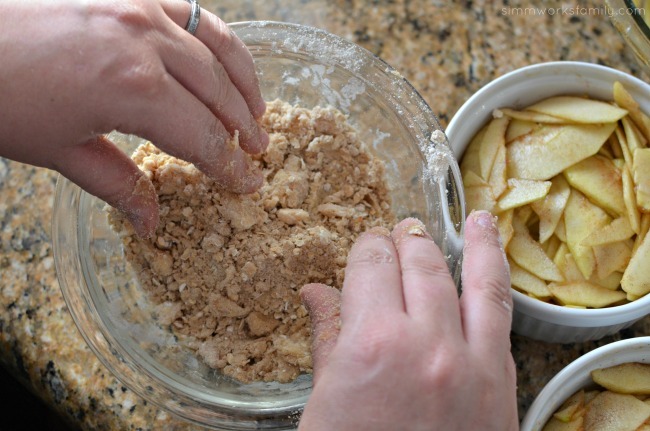 The hardest part of this recipe is peeling the apples. Seriously! Everything else goes so quickly, including cutting the apples into thin slices. 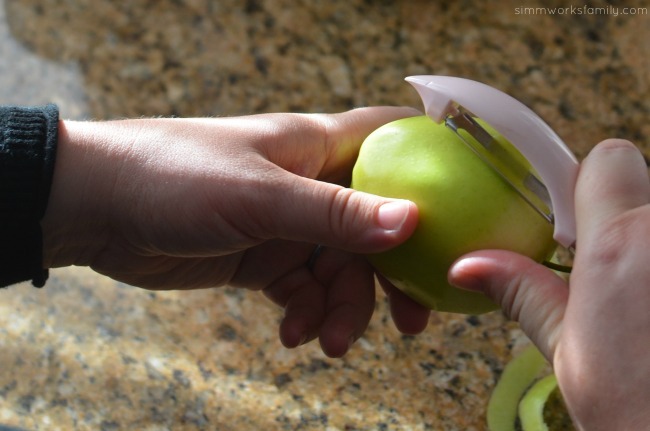 Tip: Use an apple slicer to cut and core your apples at the same time. Then thinly slice each wedge into the same size slice to ensure even baking time for all of the apples. With a recipe from my childhood, a cozy spot on the couch, and my husband by my side, I’m one happy woman. Making new memories to keep old memories alive is something I cherish and enjoy doing each year. 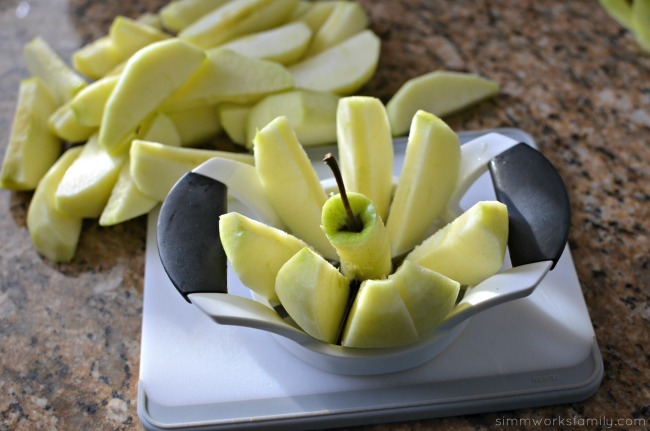 Peel apples and use apple slicer to core and cut each apple. 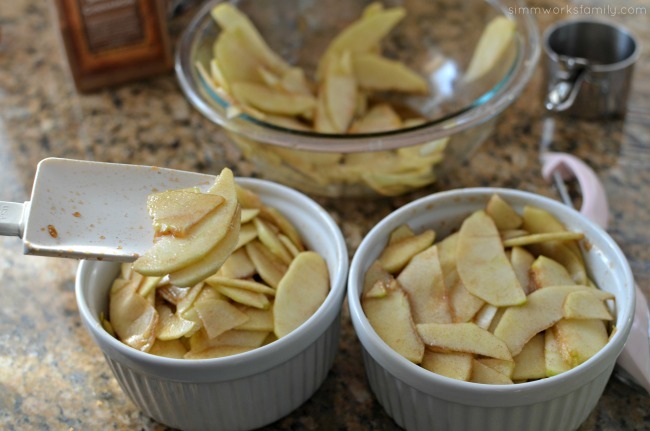 Then take each apple wedge and cut thinly into even slices. Combine all filling ingredients into a large mixing bowl and toss together until thoroughly mixed. Divide filling mixture into prepared ramekins and set aside. Preheat oven to 350°F. Lightly grease 2 large ramekins with butter. Set aside. Place oats, flour, sugar, cinnamon, and brown sugar in a mixing bowl and stir together. Place crisps onto a baking sheet and bake for 25-30 minutes or until golden brown. Allow crisps to cool for 5 to 10 minutes before serving. 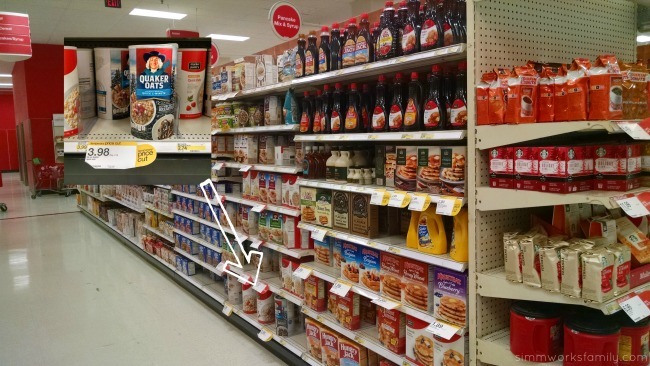 You can find the limited edition Quaker Oats Old Fashioned Oats 42oz & Quaker Oats Quick Oats 42oz winter canisters exclusively at Target. Pick up a canister or two for all of your baking and breakfast needs! Plus you can use these coupons to save a little on your purchase. 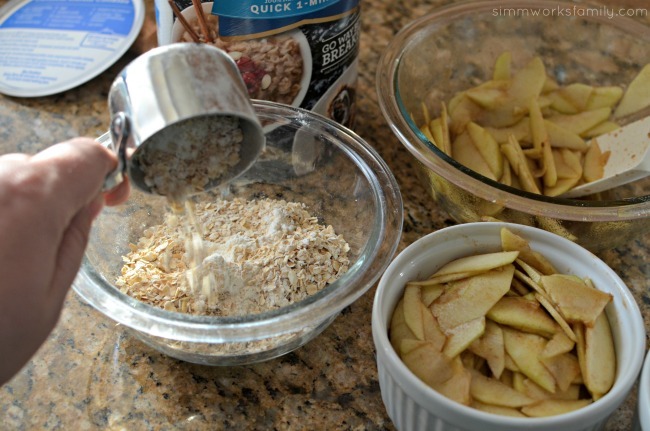 Need some suggestions for recipes to try with oatmeal? 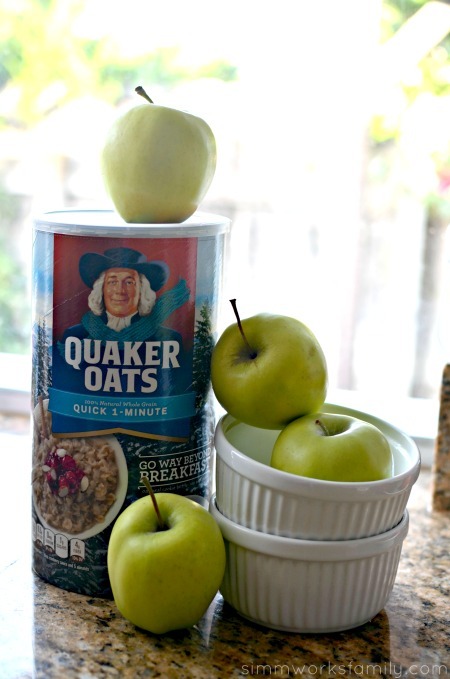 Check out my delicious baked oatmeal squares or try your hand at rice cooker oatmeal. You can also get great ideas by checking out Quaker on Twitter. What are your favorite foodie memories during the holidays? They sound fantastic. I love anything with oatmeal. Oh this sounds really good! Looks easy to make too. A scoop of vanilla ice cream on top and all set! 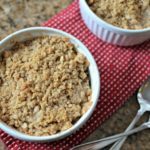 Apple crisp is one of my favorite fall/winter desserts! So delicious! I agree about the scoop of vanilla ice cream above! Yum! I am totally loving the smaller portion of each crisp! I like it but I hate making a bit batch because it never gets eaten fast enough and goes bad! 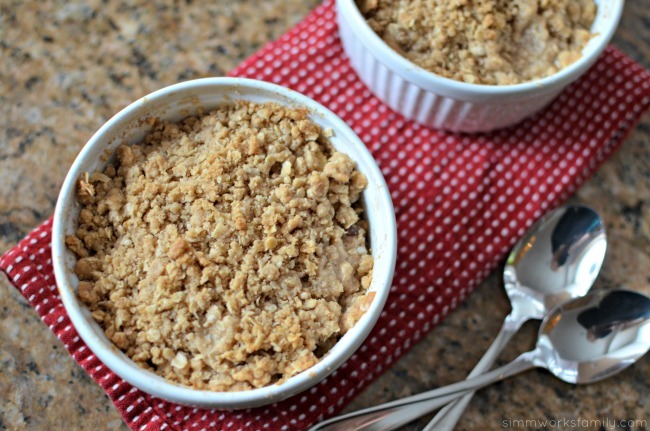 Now we can enjoy apple crisp and make JUST enough. Yum! I used to love helping my grandma make the lasagna for Christmas. Yep; we had Christmas lasagna.